Get your tickets now — seating is limited! 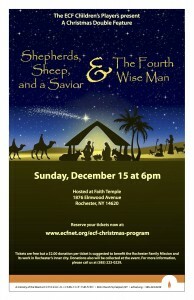 Evangelical Church of Fairport brings Rochester its annual Christmas program featuring two performances by the children of ECF: Shepherds, Sheep, and a Savior & The Fourth Wise Man. The program will be hosted this year at Faith Temple, 1876 Elmwood Avenue, Rochester, NY 14620, at 6 p.m., Sunday, December 15. Tickets are free but a $2.00 donation per ticket is suggested to benefit the Rochester Family Mission and its work in Rochester’s inner city. Donations also will be collected at the event. For more information, please call us at 223-0229.